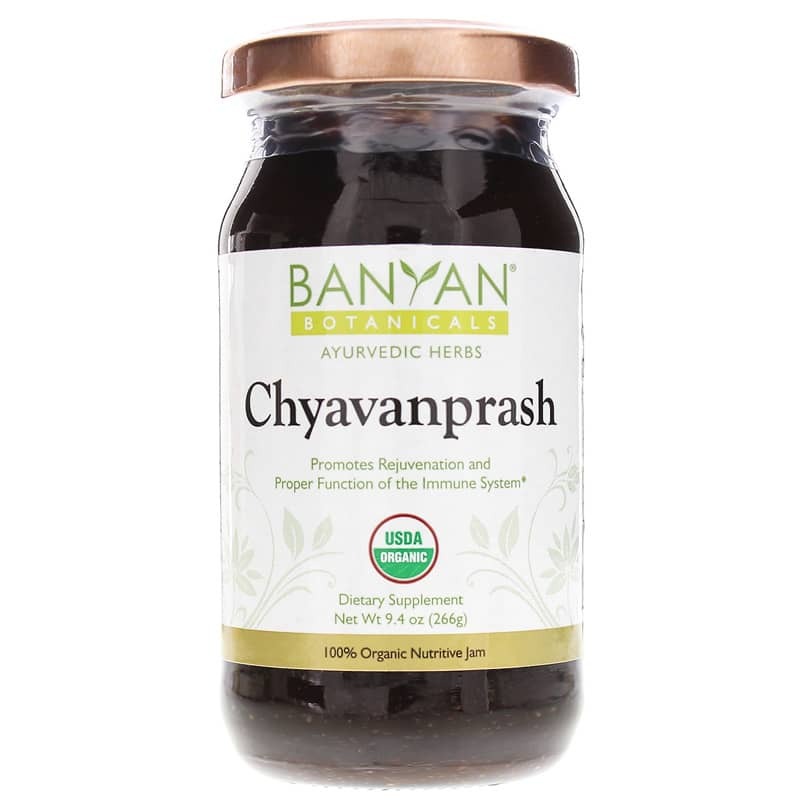 Organic Chyavanprash by Banyan Botanicals is a traditional Ayurvedic herbal jam made in a base of amalaki fruit, a rich source of antioxidants. 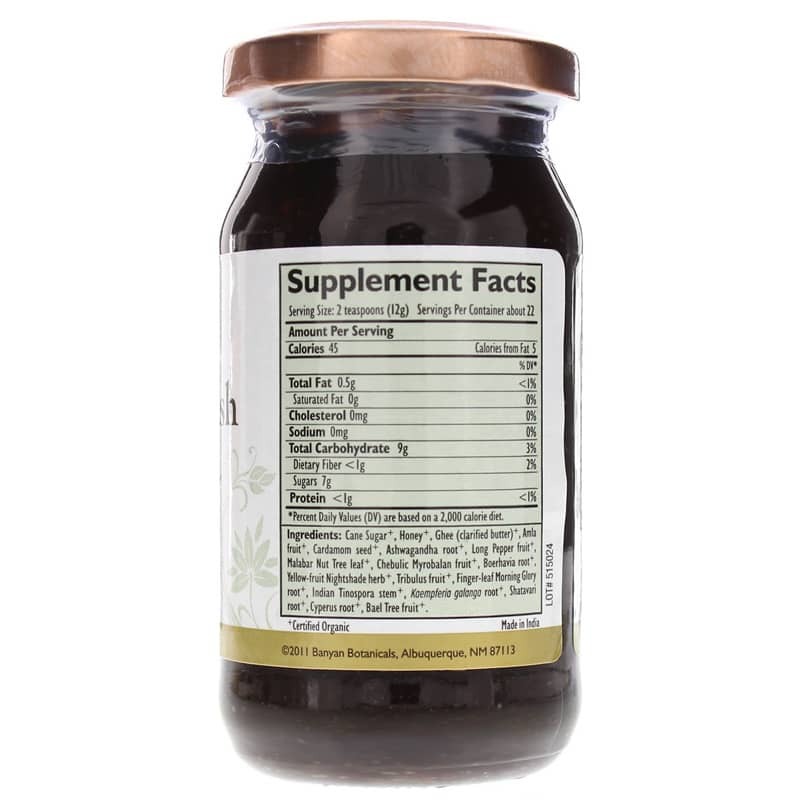 This excellent rejuvenative nourishes and strengthens the body, providing energy and vitality. Use daily to support overall health and well-being*. Chyavanprash is an excellent method for daily herbal consumption due to its unique constituents of cane sugar, ghee and honey. With over a thousand years of use, these nourishing tastes play the important role of "carriers" that allow the herbs to penetrate deep into the tissues. In a small daily dose (1 or 2 teaspoons), it's tasty and very healthful. Ingredients: Cane sugar*, Honey*, Ghee (Clarified Butter)*, Amla fruit*, Cardamom seed*, Ashwagandha root*, Long Pepper fruit*, Malabar Nut Tree leaf*, Chebulic Myrobalan fruit*, Boerhavia root*, Yellow-fruit Nightshade herb*, Tribulus fruit*, Finger-leaf Morning Glory root*, Indian Tinospora stem*, Koempferia galangal root*, Shatavari root*, Cypres root*, Bael Tree fruit*. Adults: 1 to 2 teaspoons, once or twice daily, or as directed by your health practitioner. This Organic Chyavanprash is one of the best I've had - a little pricey but it is organic and very easy on the palate.